'Field Guides' were handed out to all visitors, allowing them to choose the species of bird they would like 'to be' in the dome. Both the real birds and sculptural birds (stand-ins for actual threatened bird species) were intermixed to provide the typical field guide hide-and-seek experience. 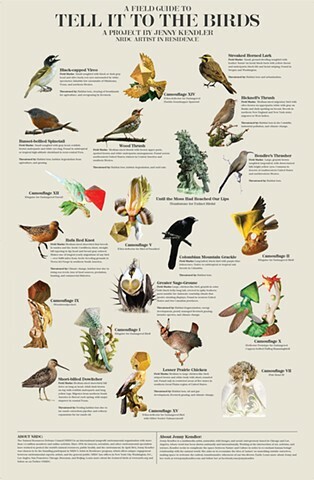 The sculptural (visual) birds listed the title and media of the sculptures, while, actual (audio) birds were represented by photos and information on why the each species is imperiled, threatened or endangered. All audio species are North and South American birds. Field Marks • Large, grayish brown songbird; long-tailed, with down-turned bill; bright yellow eyes. Common in deserts of southwestern United States and northwestern Mexico. Threatened by • Habitat loss, solar development in the Mojave Desert’s Pisgah Valley. Field Marks • Medium-sized migratory bird with olive-brown on upperparts; white with gray on flanks and dark spotting on breast. Field Marks • small songbird with black or dark gray head and olive back; red eyes surrounded by white spectacles. Inhabits low savannahs of Oklahoma, Texas, and northern Mexico. Threatened by • Habitat loss, clearing of brush lands for agriculture, and overgrazing by livestock. Field Marks • Long-tailed, black bird with purple-blue iridescence; native to subtropical or tropical oak forests in Columbia. Threatened by • Habitat Loss as the East Andes are logged, burned and cleared for conversion to agriculture, firewood, cattle grazing and gold mining. Field Marks • large, chicken-like bird, grayish in color with black belly; long tail, covered in spiky feathers. Most notable for elaborate courtship rituals that involve strutting displays. Found in Northwest United States and two Canadian provinces. Threatened by • Habitat fragmentation, oil and gas development, poorly managed livestock grazing, climate change. Field Marks • Small, ground-dwelling songbird with feather ‘horns’ on head; black back with yellow throat and underparts; black bib and facial striping. Found in Oregon and Washington. Threatened by • Habitat loss, and urbanization. Field Marks • Medium to large chicken-like bird; striped brown and white body with short, rounded tail; found only in restricted areas of five states in southern Great Plains region of United States. Threatened by • Habitat loss, oil and gas development, climate change. Field Marks • Medium-sized shorebird that breeds in tundra and Arctic Cordillera; short, straight bill tapering to tip. Head and breast gray colored; makes one of longest yearly migrations of any bird - over 9,000 miles from Arctic breeding grounds to Tierra del Fuego in southern South America. Threatened by • Climate change, habitat loss due to rising sea levels, loss of food sources. Threatened by • Habitat loss, habitat degradation from agriculture, grazing. Field Marks • Medium-sized shorebird; bill twice as long as head. Adult dark brown on top with reddish underparts and long, yellow legs. Migrates from northern South america to Boreal each spring, with major stopover in coastal Texas. Threatened by • Nesting habitat loss due to tar sands extraction; pipeline and refinery expansion for tar sands oil. Field Marks • medium-sized thrush, with brown upper parts; spotted brown and white underparts. monogamous; found across North America; winters in Central America and southern Mexico. Threatened by • habitat loss and degradation, acid rain. Breeds in the Boreal Forest and is therefore also threatened by tar sands exploitation.